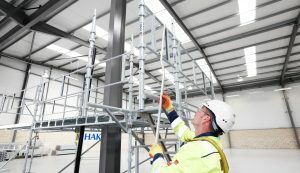 HAKI is pleased to now offer the CISRS System Inspection Training Scheme (SITS), as part of the growing matrix of scaffold training courses available at our dedicated training center in the UK. Teaming up with CISRS to offer a standardised approach to systems training, the 1-day course will include a theory test based on general inspection and HAKI system product knowledge, as well as a practical exam based on drawing of the structure and faults provided by HAKI’s qualified trainers. All delegates who successfully complete the practical and theory assessments of the course will receive a CISRS certificate and an endorsement on their CISRS card. HAKI is also offering the CISRS system inspection course at half price to customers who completed the HAKI Basic Inspection Training course during 2018, for a limited time only*. To find out more about this special offer, please contact Jackie Boniface on 01908 580420 or by email here. If you have any queries regarding the System Inspection Training Scheme or HAKI training in general, please email training@HAKI.co.uk, or book your space on a course now by clicking here. *T&Cs apply. HAKI reserves the right to withdraw offer at any time.